One thing I've wanted to share, is this wonderful, amazing, really empty box that I have. I absolutely love it! It makes me feel so good inside! That means I have one of these!!! That's right! A very old, and now completed, WIP [work in progress]. Yay!!! I started embroidering these vintage Halloween blocks about 4 or 5 years ago. They've pretty much been done for the last year or two and I finally [on a whim] pulled them out the other day to put them all together. I got the patterns from a friend of my mom's [who only had 7 of the 8 ?? embroidery patterns]. But by the time I pulled out the pattern again, I had misplaced the instructions for the blocks that went between the embroidered blocks. So, I whipped up these scrappy, Irish Chain blocks instead. I love them and have really been feeling the look of Irish Chains lately. I knew I just had to incorporate it somehow in this quilt. So I bought 2 yards. I love the look of these dots since they have a little bit of "antiquing" on them. I think they go really nicely with the quilt. I bought the black and tans [that I used on the Irish Chain blocks] for another project I was going to start, but decided to go a different route with that one, so I was happy to know they would be put to good use in this quilt. And, finally, I couldn't resist some ticking for the back and this cute little label by Riley Blake. The label is pre-printed and comes with a bunch of different ones on one panel. So cute, right? I really like this- love the tan, cream and black combo. And that embroidery.... fabulous! 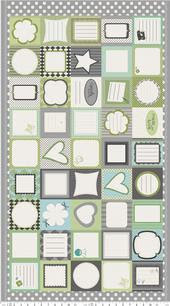 Like you I am really liking Irish Chain blocks right now too! I just haven't started making one yet. Thanks for sharing! Me too. I would love to know where these darlings came from! I love a good Halloween quilt and I love a finished quilt...Looks to me that you have both!! Good job! I love the stitchery designs. They look very vintage. Is the fabric their stitched on quilted? It has a quilted look to it in the photos? Your color choice for the blocks was spot on too. This is going to be a great quilt that you'll look forward to displaying every fall. Adorable!!! Beautiful craftsmanship, colors, textures...everything! I'll be reading to see if anyone comes up with the source of the pattern. This was bothering me all day, because I knew I had seen it somewhere. And then I looked at my favorites and there it was on a site called Yesterday's Charm http://www.yesterdayscharm.com/storename/yesterdayscharm2/dept/271256/ItemDetail-10685141.aspx. The pattern is called Jolly Halloween! Lynn ~ you're awesome. Thank you so much! Want a free pattern? Just let me know which one!!! Oh I just love those quilts in your header. And that Vintage Halloween quilt is priceless! So different than anything I've seen before. Glad I found your blog. This is a fantastic finish! I love how it isn't orange or typical colors! Glad you found the pattern and I can't wait to see what it looks back from the quilters. Ooooh, I LOVE this adorable little quilt -- the embroidery is just too cute. And we really ARE on the same page -- I think the black and white polka dot was my favorite fabric in my ghastlies quilts! I have these transfers--I love that you used black thread. This may re-motivate me to do them! !